Pimo and Rex released simultaneously in English and German at the tail end of last year, thanks to a collaboration between publishers Rotopol Press and Blank Slate Books. 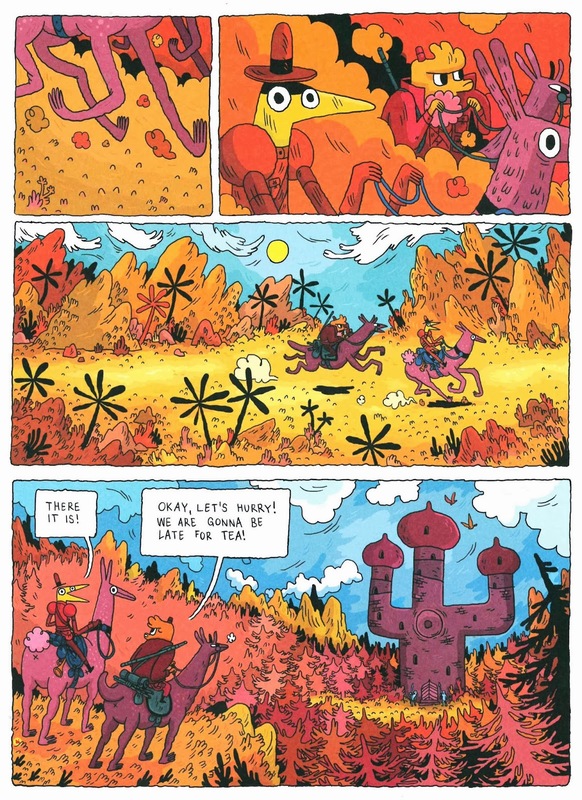 I've been dying to get my hands on a more lengthy book by German artist Thomas Wellmann ever since seeing his double page spreads in anthologies Neufundland and Karagoz, and this doesn't disappoint. Full marks to the publishers, too for printing it just under a standard A4 size, giving Wellmann's art the space and breadth it truly deserves. It doesn't say what kind of paper has been used, but it's thick and quality, almost card stock with only a slightly glossy finish. The book contains 2 stories featuring best friends Pimo- an aspiring novelist, and Rex, a talented chef. Rex is a more sedate fellow while Pimo has a more artistic temperament, prone to impulsiveness, but the two bring out the best and worst in each other. The first story is the lengthier tale, in which, after a refreshing ride on horseback, Rex announces his engagement to his delighted friend, and the two celebrate by way of extreme merriment and inebriation- 'Pimo, I am totally wasted.' 'Me too, Rex, me too.' Neither being in any condition to do much at all, they decided to spend the night at the inn in which they have been having such a good time. One thing leads to another, and before you know it, the middle of the night has amassed a beautiful fugitive, indiscretions, a kidnapping, and sword-fighting with some very strange villains, prompting the fellows to mount a rescue mission the very next morning. 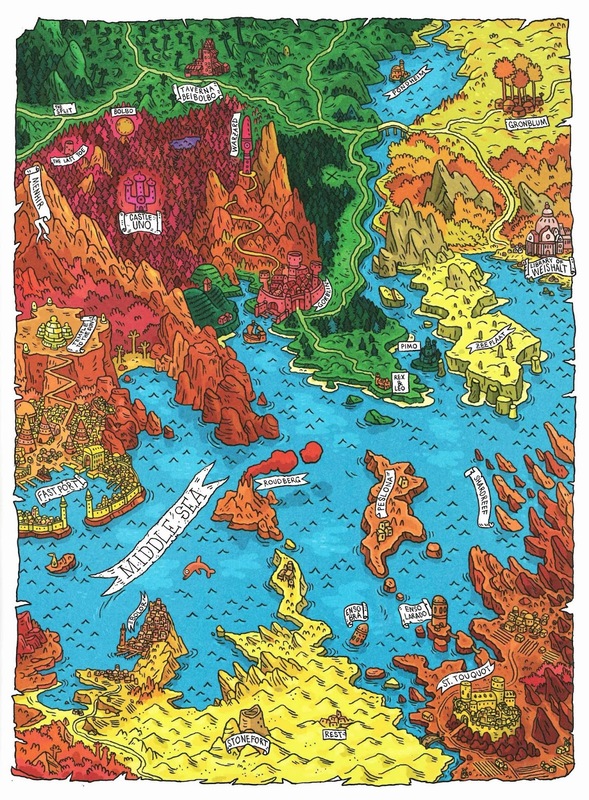 Reading Pimo and Rex is like being hugged by something warm and full of good feeling; a good book is an immersive experience, but this one reaches out and ensconces you by way of it's cartooning. 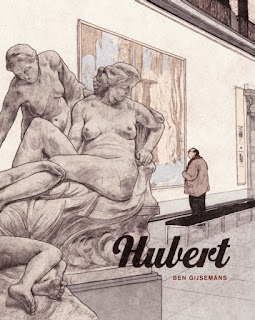 It's the sort of book you want to read on a rainy day or to cheer you up: there's real pleasure and comfort in the art, it's a tangible joy to look at. 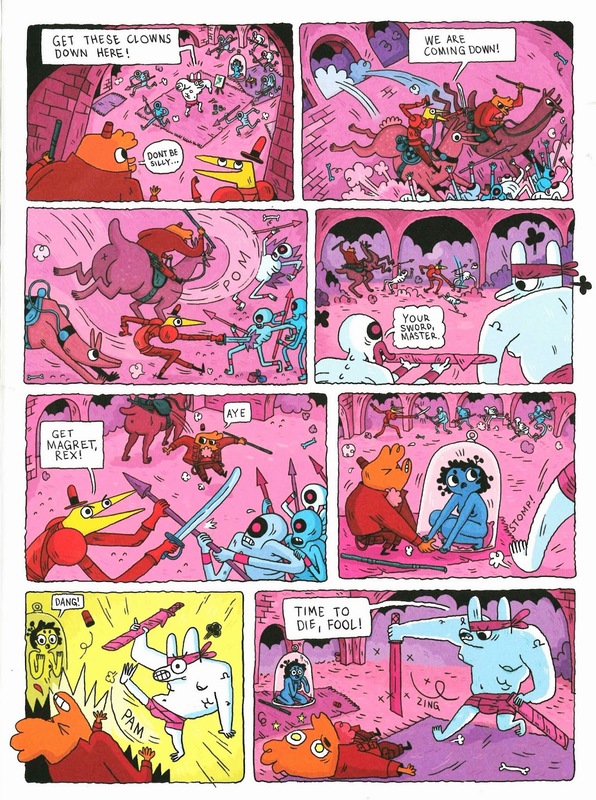 Wellmann lists Joann Sfar, Christophe Blaine, Don Rosa, Franquin, Guy Davis, Nicolas Mahler, Michael Deforge, Tove Jansson, Mawil, Mike Mignola, Uderzo and Goscinny, Gipi, and Lewis Trondheim as influences on his work, and some of those are clear to see. 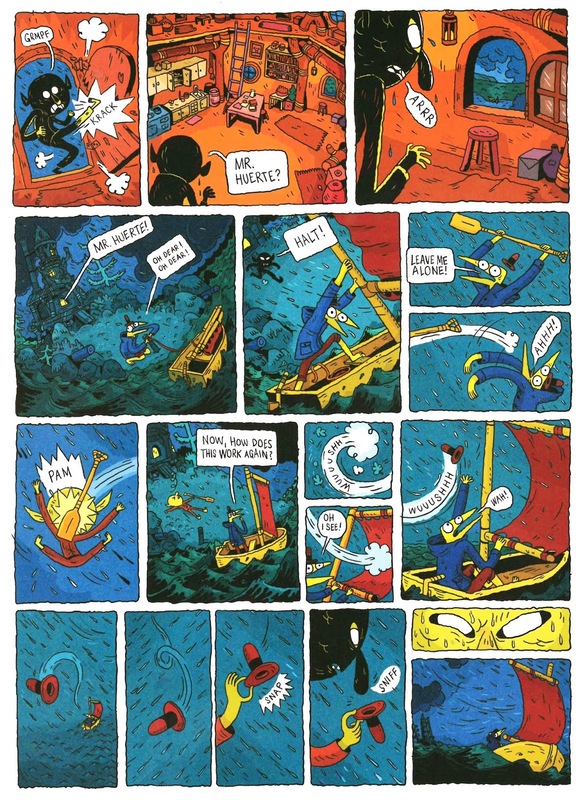 Here, in particular, the Trondheim leanings are very evident- in the character designs, the adventure story with fantasy and magical elements, the affablity and humour, the liveliness, the bedraggled hyperactivenss and slightly slacker personalities. Both Trondehim's Dungeon and Harum Scarum series come to mind, and not in any bad way. Wellmann is a little more zany and surreal with his choices: see those clouds and mountains in the page below meltingly waver and re-shape in the heat, and the trees with their bronchi branches-his art is a tad more visceral, (there's some obvious video gaming influence) where Trondehim has a very clean, linear approach. 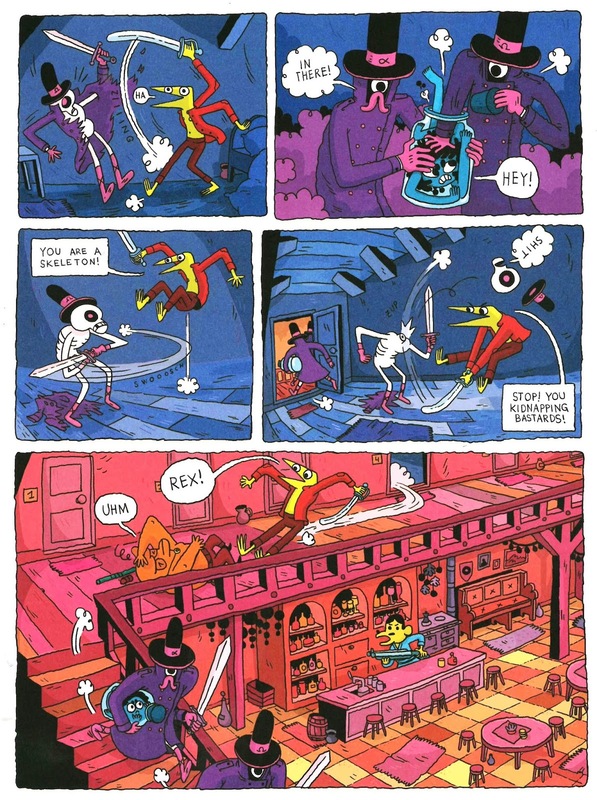 What also sets Wellmann apart (and what imbues his pages with those happy, warm feelings), I would suggest, is the use of his colouring: bright, strong and perfectly coordinated- look, for example, at the blue and purple sitting next to each other in the page below, with the purple allowing for elements of coordinating pink to be introduced, which paves the way for the next half page panel to harmoniously burst into a full pink, yellow and orange scene. It's really well thought out, as not only does the color change reflect the alteration in location and lighting, but the purple henchman still match against the pink background. I like how he blocks off sections, and even within panels, with blocks and shades of one color at a time, and not traditionally associative uses. I'd imagine that this match-matchy style is pretty difficult to do, without making it appear overwhelming, with one colour having to lead into another sensically and making it all look attractive at the same time. As you can see, it really works. The second story in Pimo and Rex finds Pimo once again in a bit of bother as he's hunted down by the Archlibrarian for a rare library book he's manged to lose.I actually preferred this one to the first- in regards to plot, that one felt like a reason to include and hold certain components together, where this was the more natural story. 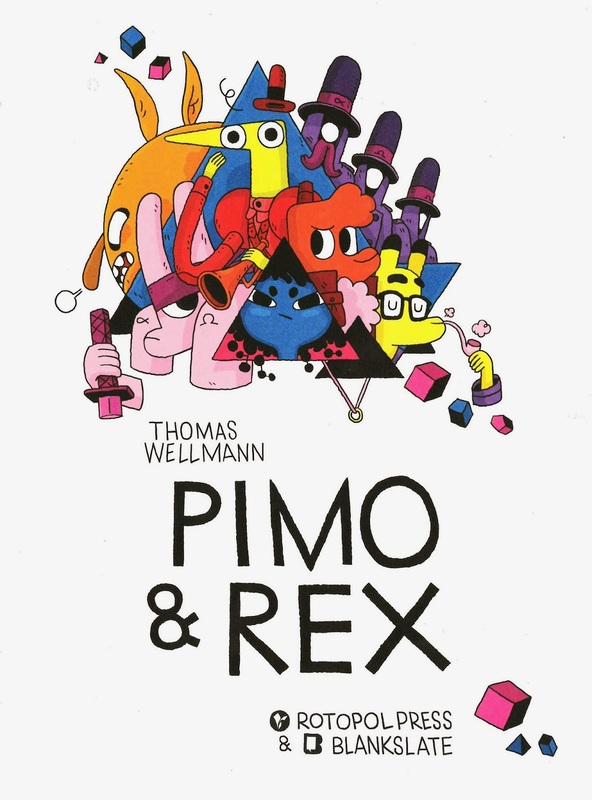 However, to be frank, whilst very enjoyable and entertaining, Pimo and Rex isn't even really about the quirky adventures, it's about the loving, understanding, overbearing, frustrating friendship between these two great characters, and reading it is a way of spending time with them and the gorgeous world Wellmann has created. Easily one of the best-looking books I've read in the past year. Huge anticipation for whatever Thomas Wellmann does next. You can find Wellman's Tumblr here, and his website here.